This week we kicked of the house renovation with our first big project. Taking down the Magnolia tree in the front yard. As much as it was sad to see the tree go, it had to go to bring a gas line into the house. Without the tree there it will be much easier for the contractor to add the second floor as well. We hired a local tree expert to take down the tree, due to its size and proximity to the power lines. We knew it would be too dangerous to take down ourselves. We used Frank's Tree Work, owned and operated by Frank McIver, who does excellent work. 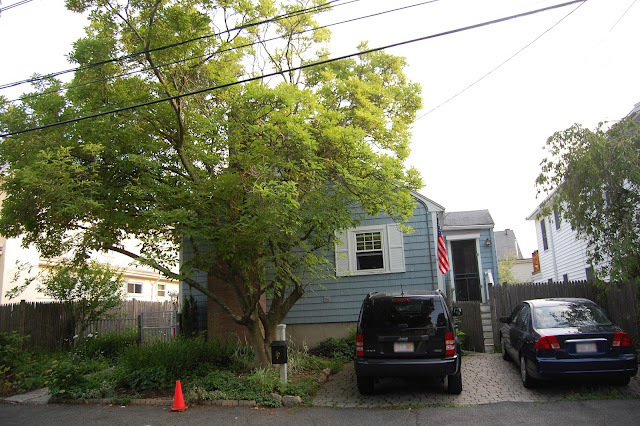 I would recommend him to anyone who is looking for someone to trim or remove a tree in the North Shore of Boston. This was really something to get to see. Even the neighborhood kids came out and watched. What a difference. Looking forward to sharing each step along the way.